Now, this is a band which has grown! Since the release of the not-overly-impressive debut 'Særimners kød' from early 2011, Vanir have done a bunch of live gigs and also managed to record this new round of folkish Viking metal - and you can tell something happened with the band over this comparatively short time. Whether it's the addition of a lead guitarist or the change of producer to Swedish Berno Paulsson, I don't know, but fact remains that 'Onwards Into Battle' has a lot more weight and much more powerful songs than its predecessor. Bagpipes, whistles, acoustic guitars and keyboards are of course on the menu for this colourful feast of metal. The entire album is a rich blend of metal and folk, and there's a lot going on - even if the last track, Sons of the North, is a surprisingly quiet conclusion to an album which is one long invitation to dance. 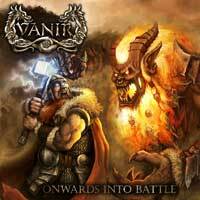 Where I wasn't really convinced that the party would take off with the first release, I'm inclined to say that I'm looking forward to seeing Vanir live sometime soon now.